A Spanish member of parliament was expelled from the chamber for speaking English amid a simmering dispute over Catalan independence. During a debate on an anti-corruption bill on Monday, Alfred Bosch criticised a decree to introduce education in Spanish and English as well as Catalan in the Balearic Islands, which drew a warning from speaker Cecilia Villalobos for straying from the topic. Mr Bosch then switched from Spanish to English to reply: “The Kingdom of Spain has some trouble with freedom. Freedom of speech is corrupted (sic), freedom of thought is corrupted.” That was too much for the speaker, who complemented Mr Bosch on his English but ordered him to leave the chamber. 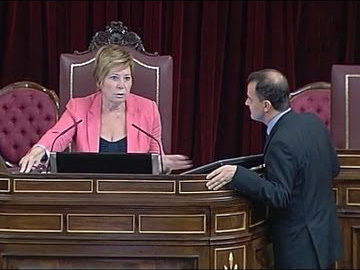 “Madame Speaker, why children and not MPs?” Mr Bosch said – in Spanish again – as he walked out.